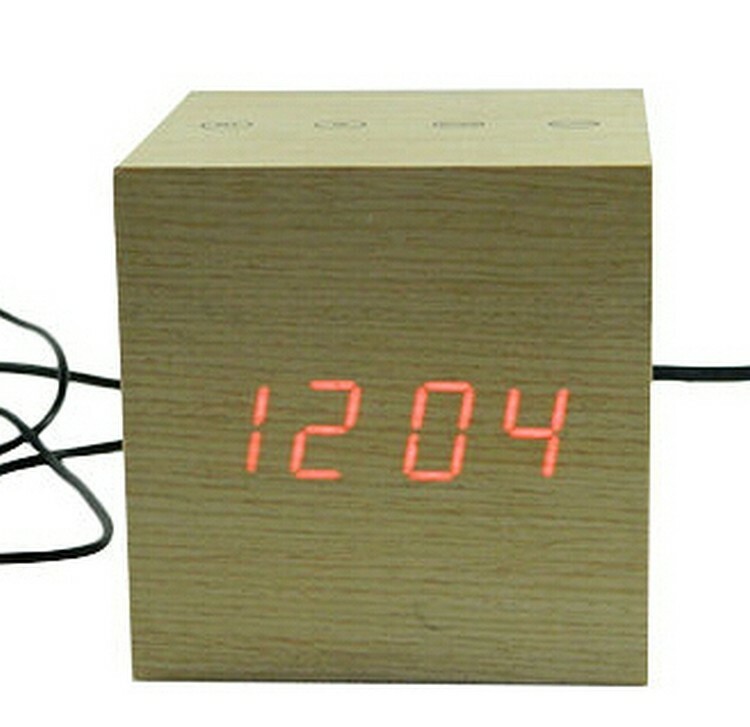 Eco-friendly desktop alarm clock, displays temperature & date. 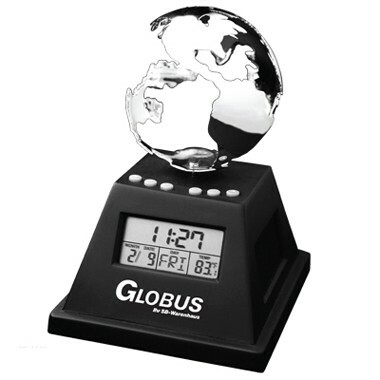 Spinning metal globe makes a great corporate gift for international businesses or worldwide advertising. 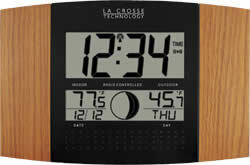 Three large solar panels provide power to the clock and to spin the globe without direct sunlight. Material is ABS Plastic. Color Available: As Shown Measurement: 4" X 6" X 5" Package: Gift Box. 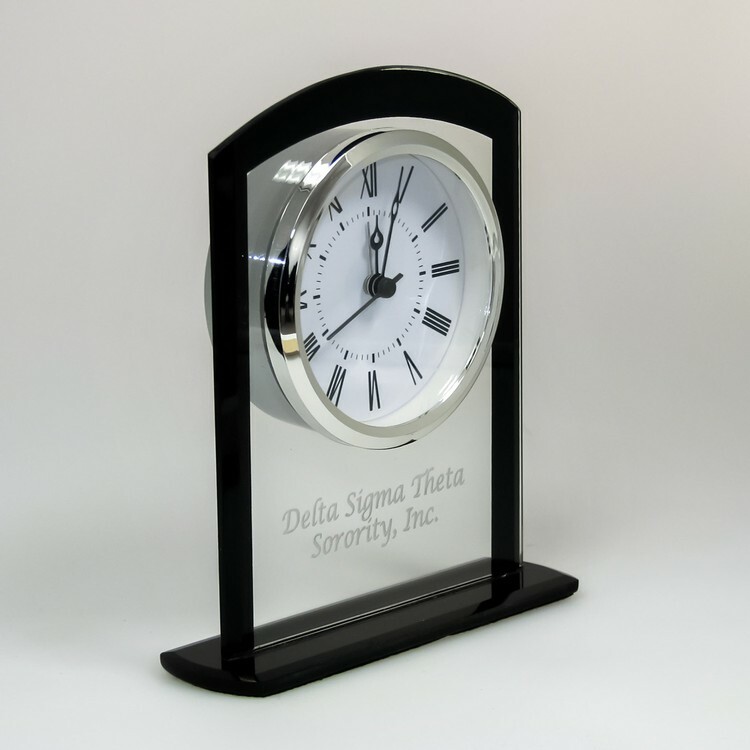 20 Pcs / 20 Lbs Imprint Area: 2" X 5/8"
Heavy metal desk clock with contemporary black designer case and a stylish black dial. Batteries included. 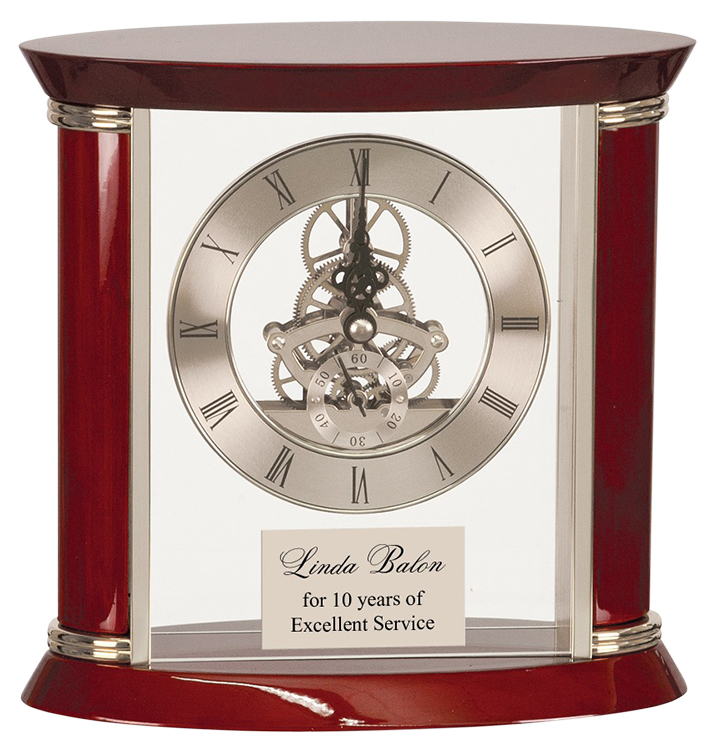 Recipients will be mesmerized watching the open clock mechanism on the Alberta Executive Desk Clock that features an open clear glass clock and mechanism surrounded by rich, traditional Rosewood with silver accents. 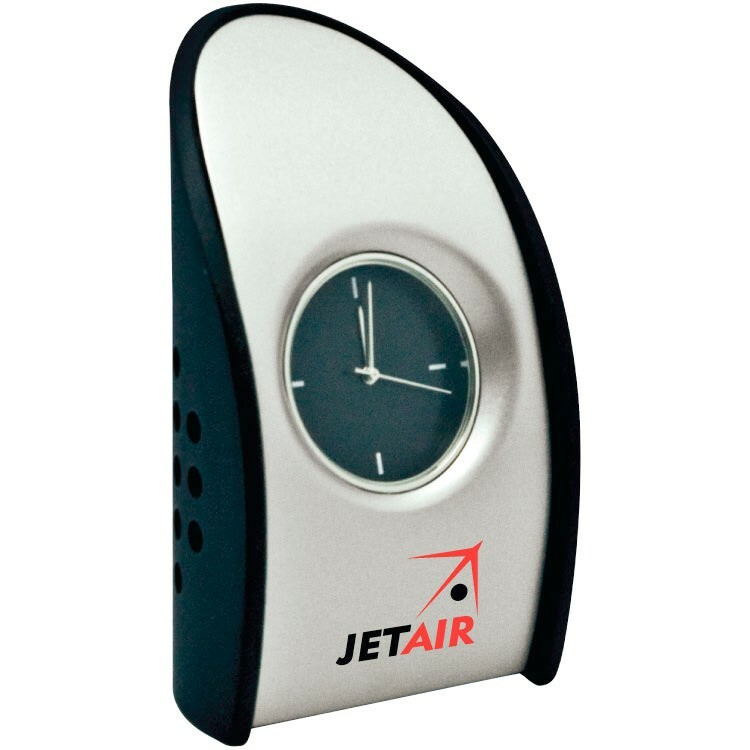 Prices include a black imprint on the silver metal plate, AA battery and individual gift box. Personalization is available at an additional charge. Recipients will be mesmerized watching the open clock mechanism on the Alberta Executive Desk Clock that features an open clear glass clock and mechanism surrounded by rich, traditional Rosewood with gold accents. Prices include a black imprint on the gold metal plate, AA battery and individual gift box. Personalization is available at an additional charge. 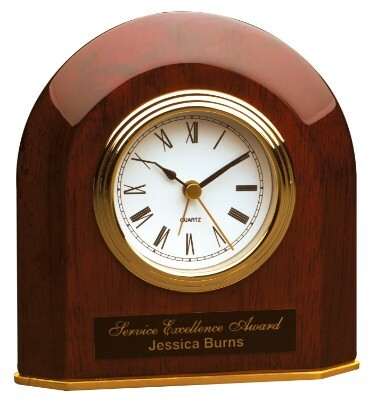 Beautifully crafted Arched Desk Clock features an elegant Mahogany Finished Wood with gold accents and felt bottom. 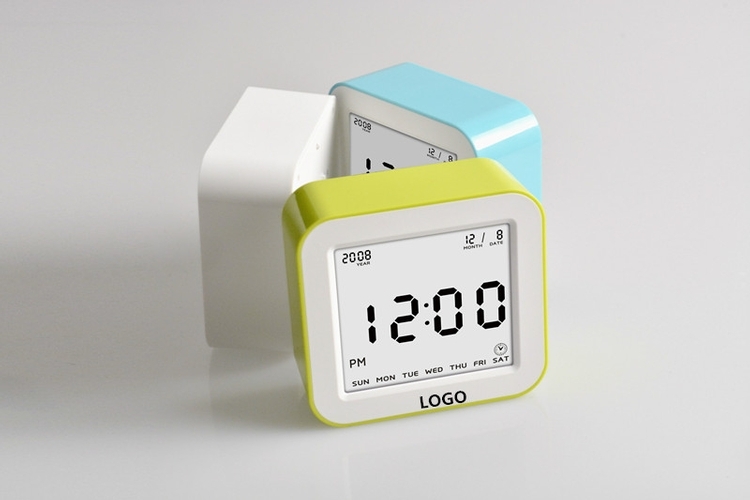 Clock features reliable Quartz movement, second hand and alarm. 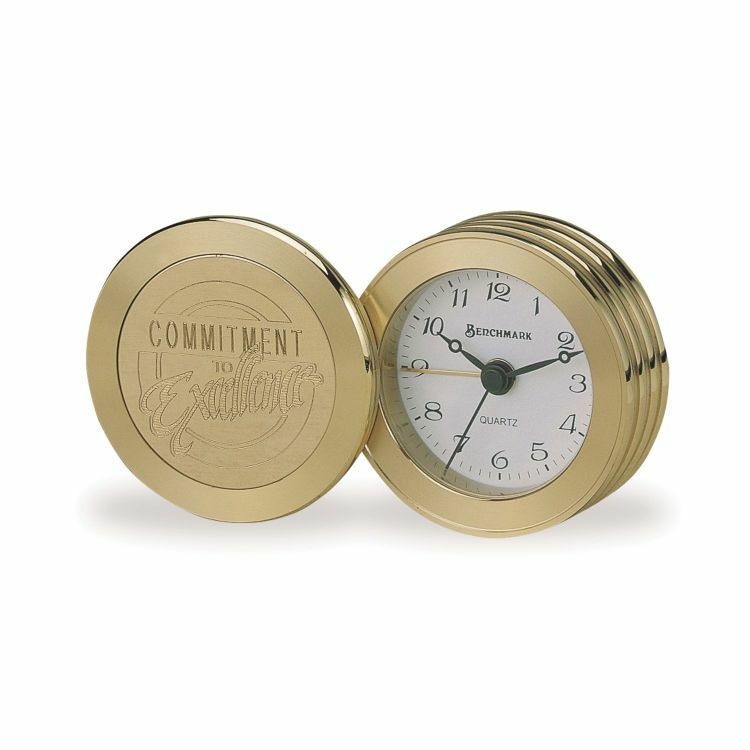 Prices include a laser engraved or black imprint on black or gold metal plate, AA battery and individual gift box. Personalization is available at an additional charge. 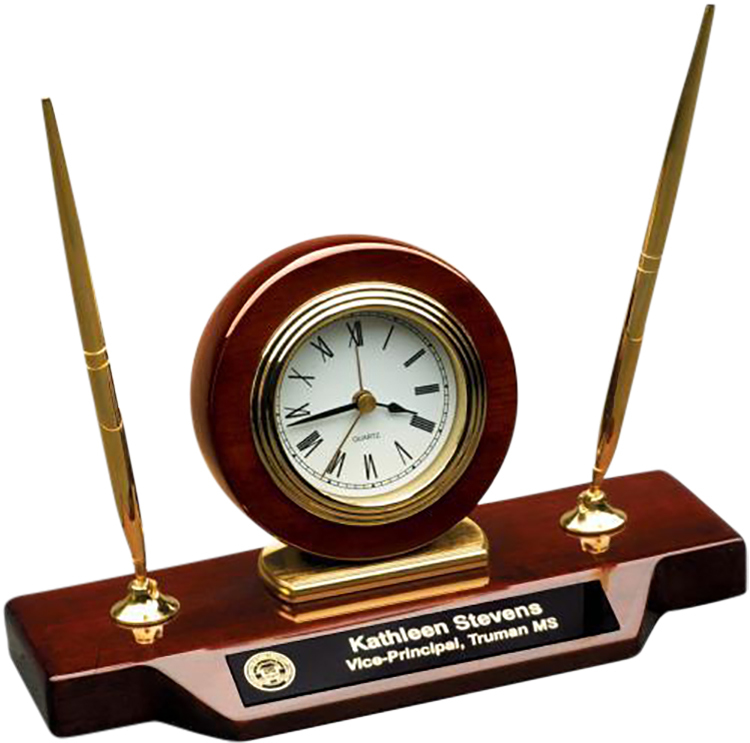 Elegant Rosewood Piano Finish Wood Desk Clock and Double Pen Set. 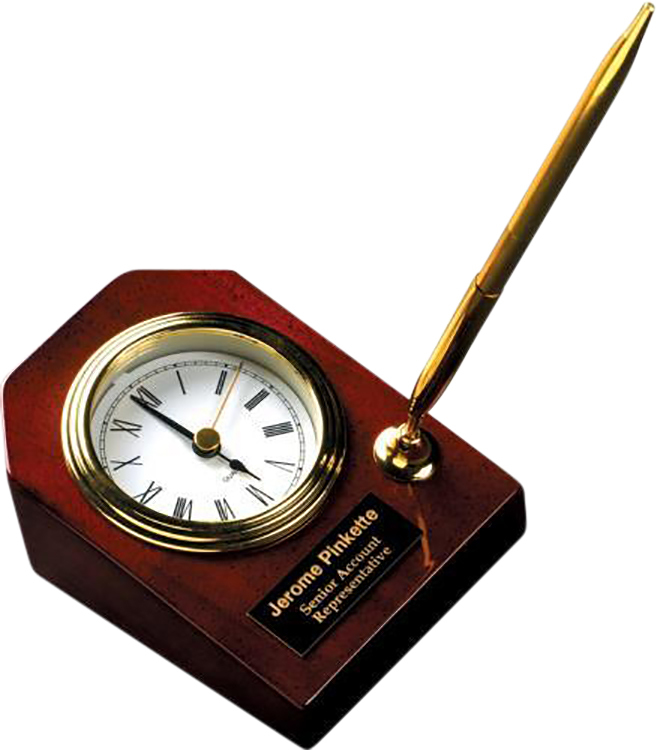 Clock features reliable Quartz movement, second hand and alarm with dual gold desk pens, all with gold accents. 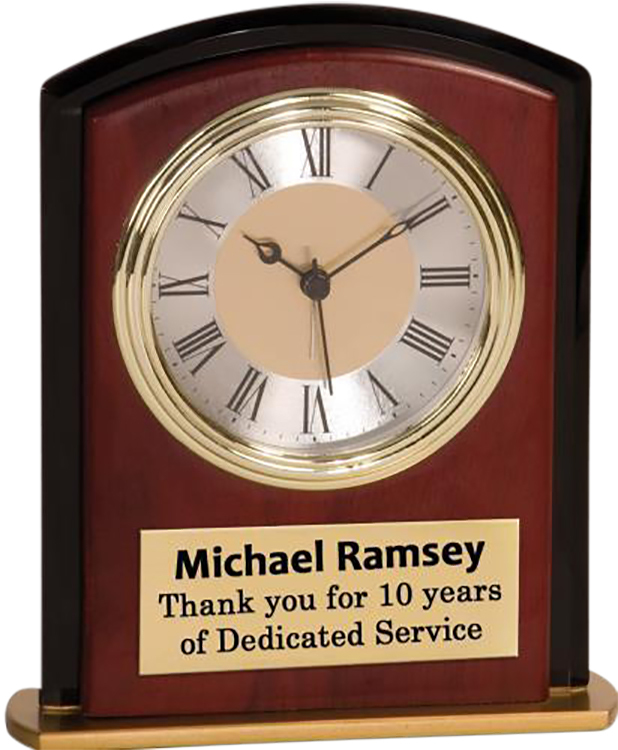 Perfect for a desk nameplate, award or employee gift. 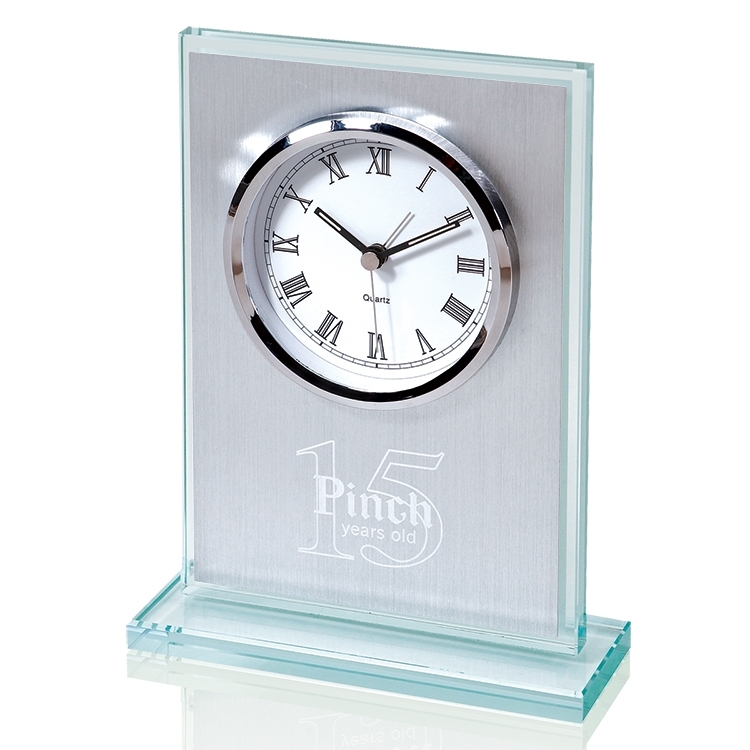 Prices include laser engraving or black imprint on a black or gold metal plate, AA battery and individual gift box. Personalization is available at an additional charge. 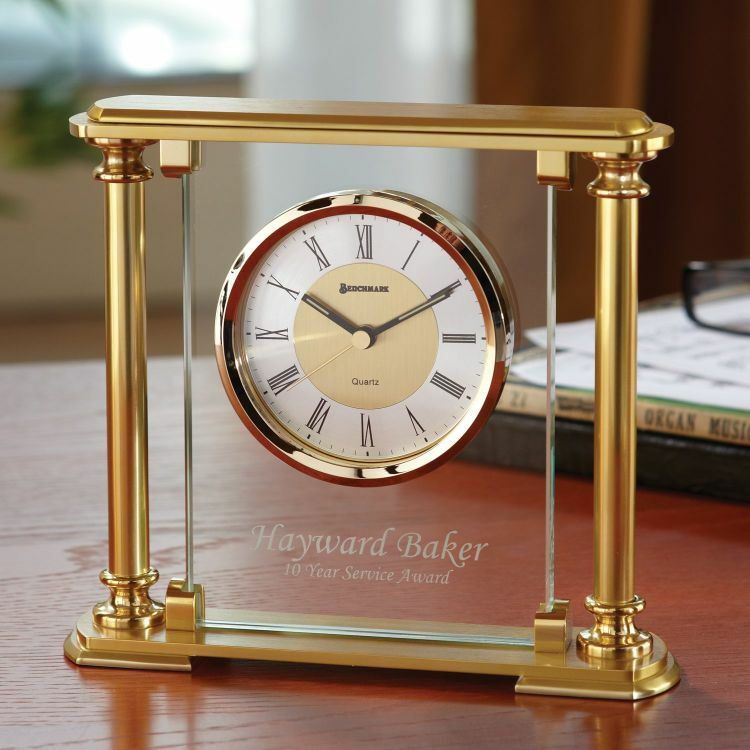 Elegant Rosewood Piano Finish Desk Clock with Gold Pen and accents is angled for easy viewing on the desk. 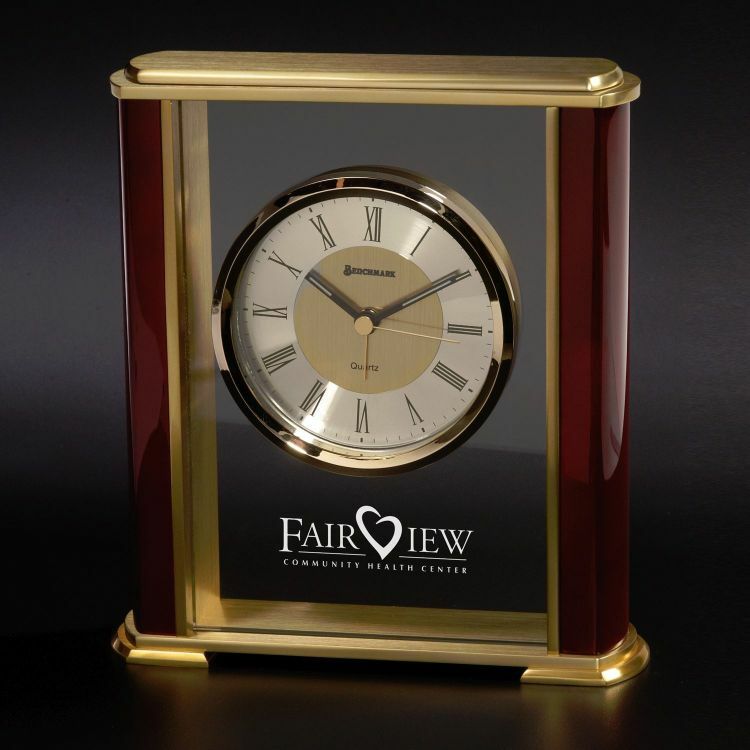 Clock features a reliable quartz movement with second hand, alarm and gold bezel. 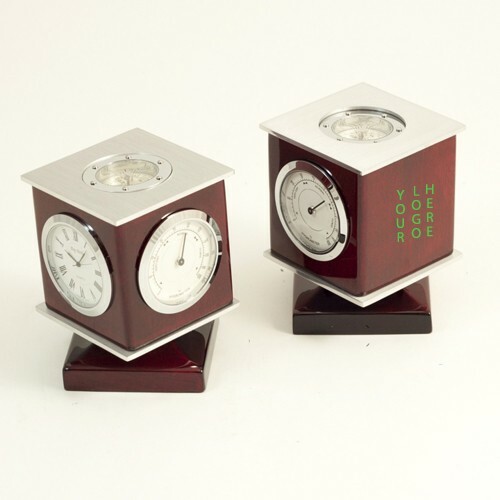 This gorgeous timepiece/pen set will keep your message in front of clients every day. 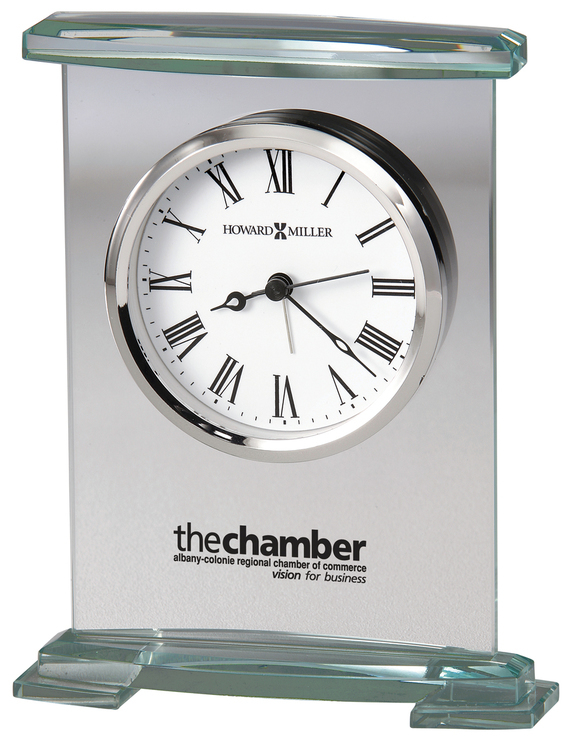 Prices include a laser engraved or black imprint on a black or gold metal plate, AA battery and individual gift box. Personalization is available at an additional charge. Slim black case with color accent; large digital display. 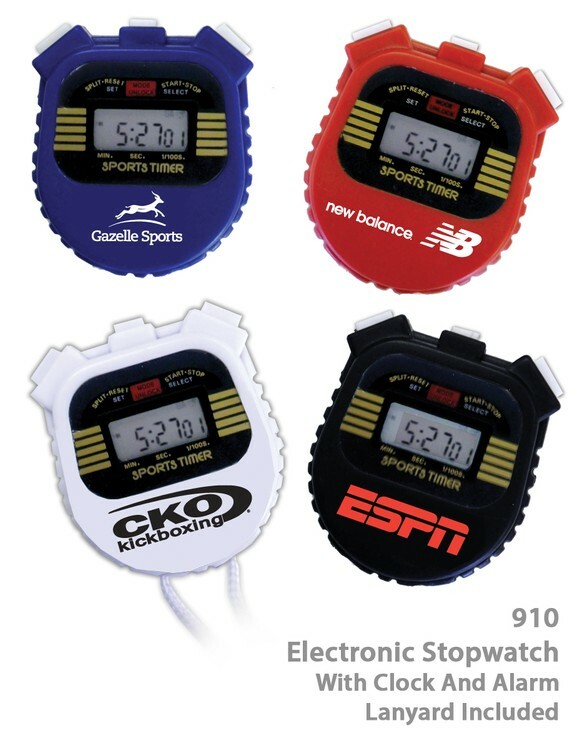 Includes: clock, alarm, and stopwatch. 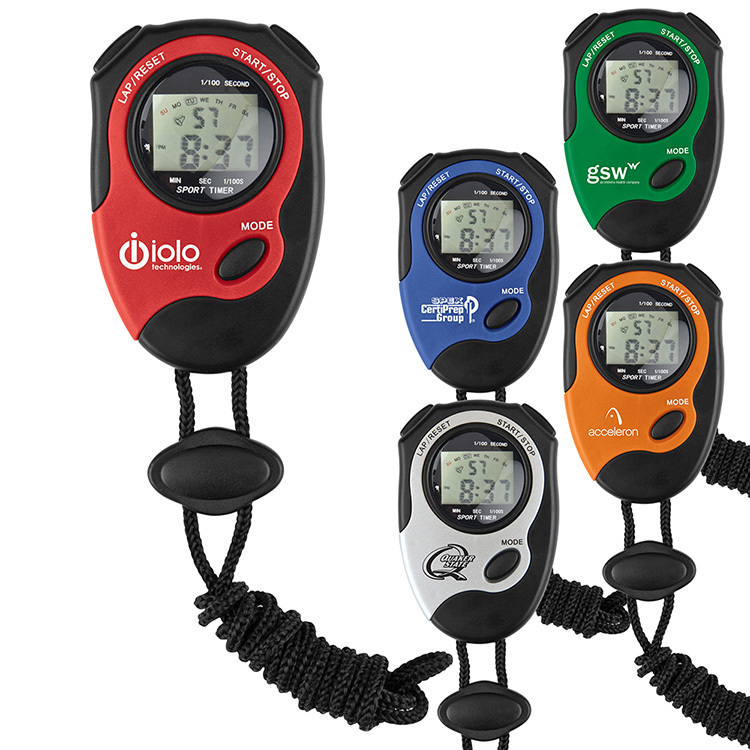 Displays time, day-of-week, date and seconds. Precise timing to 1/100 second. Black lanyard included. 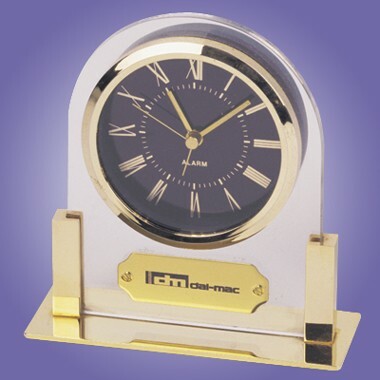 Satin finished solid brass case with 10mm thick glass suspends a quartz alarm clock. Battery is included. 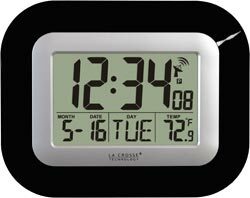 With a swiveling clock movement, you can reposition this frame to display both vertical AND horizontal references. 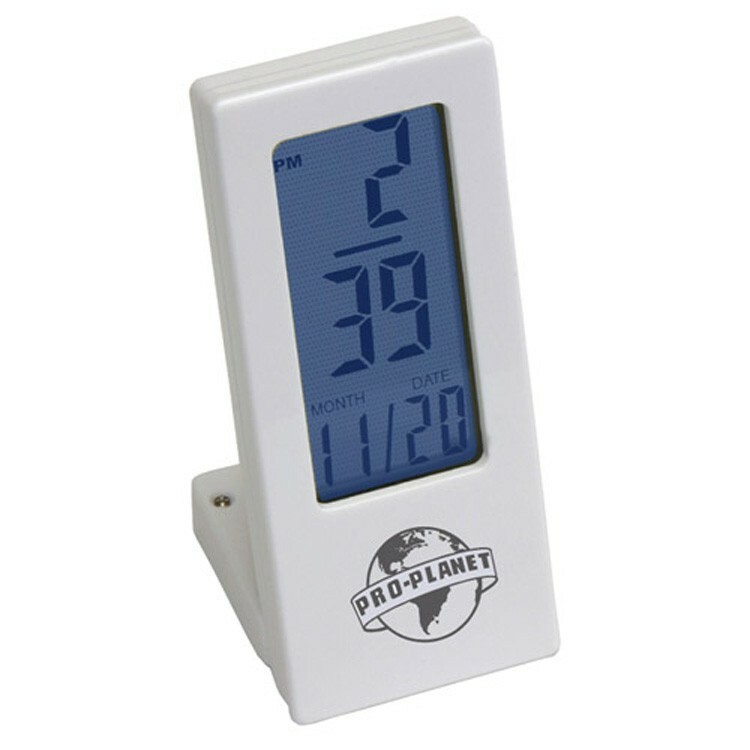 The digital display showcases the time with alarm, date, day, and temperature. 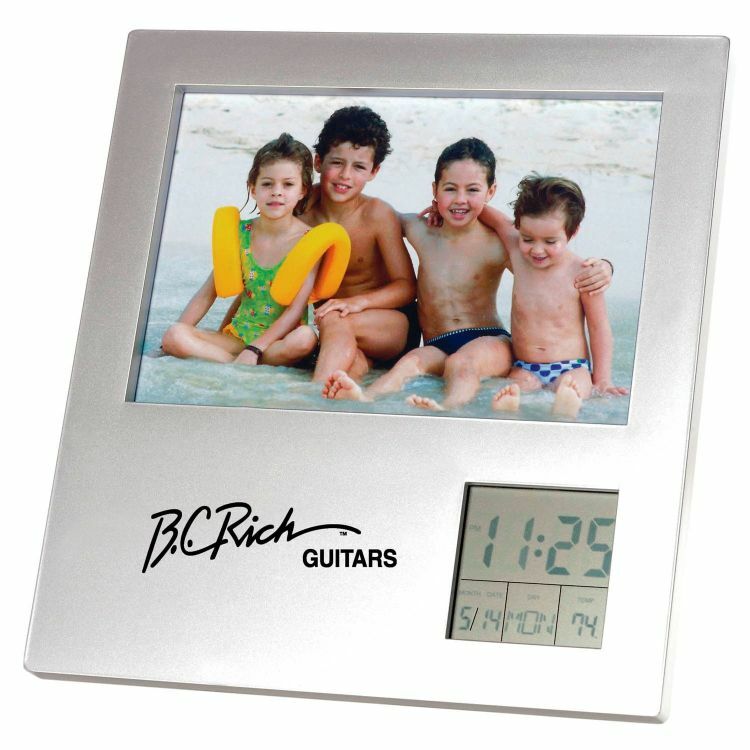 Frame holds 4x6 photo or message. 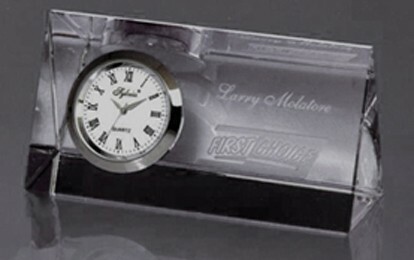 Quartz alarm clock is suspended in glass and mounted between twin columns of piano-finished hardwood. Battery is included. 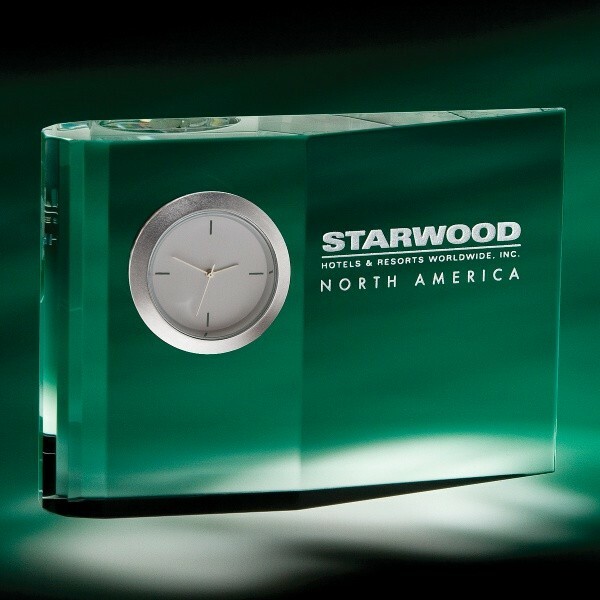 Always a favorite for corporate gifts or awards. A wonderful way to say thanks for a job well done. 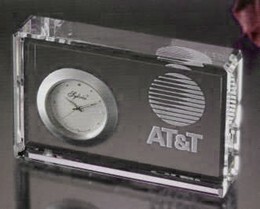 All clocks come with a 3" clock face. 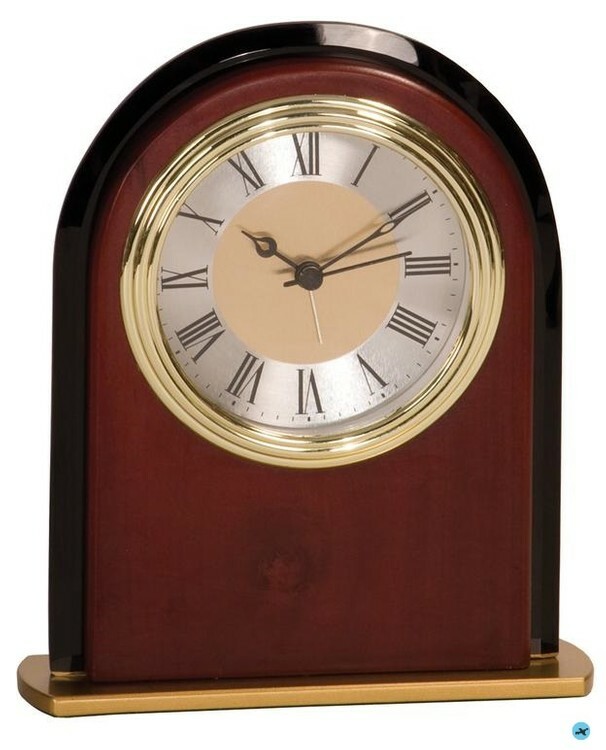 Rosewood Piano Finish Beveled Arch Desk Clock *Base is plated aluminum *Has an alarm *Batteries included *Engraved plate size: 5/8" x 3"